Tous les logiciels pour éditer vous-même vos partitions. Gott ist mein König (God is my king), BWV 71, is a cantata by Johann Sebastian Bach. He composed it in Mühlhausen for an annual church service that was held to celebrate the inauguration of the new city council on 4 February 1708. It is one of the six earliest cantatas Bach composed (along with BWV 150, 131, 106, 196 and 4) that are still extant. Like these other works, the text of BWV 71 is of a pre-Neumeister character, featuring neither recitative nor arias. From 1707 to 1708, Bach was the organist of one of Mühlhausen's principal churches, Divi Blasii church (dedicated to St Blaise also called Blaise the Divine), where he composed some of his earliest surviving cantatas. (One or two cantatas, for example Nach dir, Herr, verlanget mich, BWV 150, may have been written at Arnstadt, his previous residence, for performance at Mühlhausen.) Gott ist mein König, along with another cantata (now lost) composed the following year, was written for the annual service that took place on February 4, the day after the city held elections to install a new city council. Gott ist mein König is a significant early work of Bach. It differs from the other extant cantatas from Bach's time in Mühlhausen by its elaborate instrumentation. 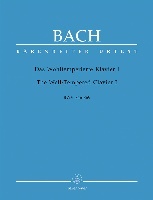 Bach went on to compose other cantatas for the ratswechsel for the town council at Leipzig, which also had a "festive" scoring, but Gott ist mein König differs from them too: very few of the formal characteristics of Bach's Leipzig cantatas (still some fifteen years in the future) are found in this early work. It was so positively received that it was the first of Bach's works to be printed (paid for by the city council); it is the only cantata to have been printed in his lifetime, at least in a version which has survived to this day. (Bach was commissioned to compose another cantata for the following year's council inauguration; there is evidence that the piece was composed and even printed, but no copies are known to survive). The printing is all the more remarkable as the council changed every year, and Gott ist mein König appears to have been intended for not more than one repeat performance. The cantata is scored for four soloists: soprano, alto, tenor and bass. The choral writing is in four parts, and the work can be sung with just four singers, although some performances deploy more singers in the choral sections. 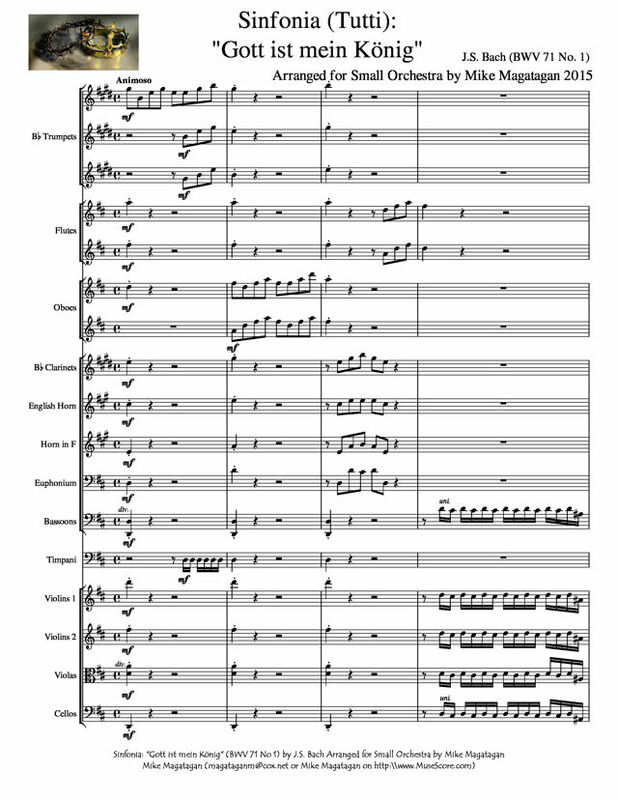 The use of a larger choir is partly a question of balance with the instrumental forces, but there is also supporting evidence in the score, where a marking implies that Bach envisaged the option of a vocal ensemble that is separate from the four soloists. 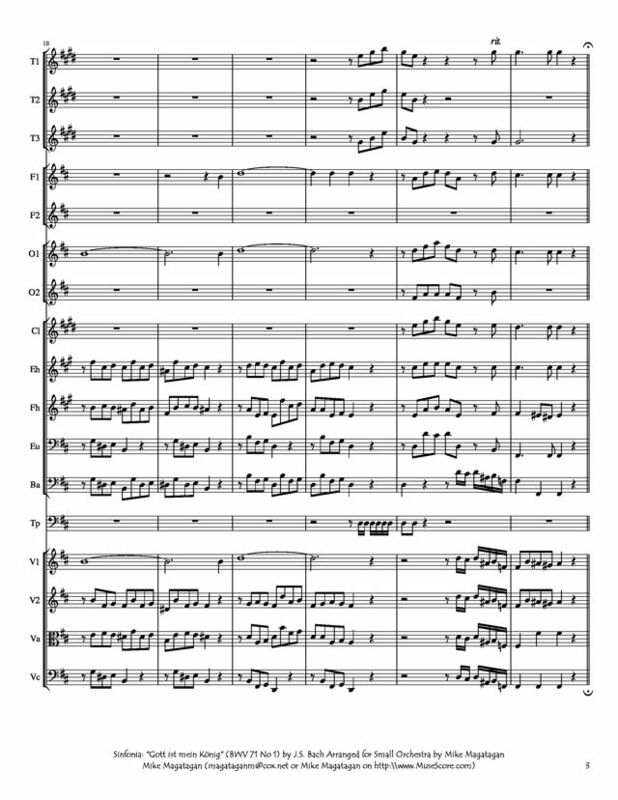 This was Bach's first cantata for festive orchestra, including trumpets and timpani. The instruments are divided into four spatially separated "choirs", placing the work in the polychoral tradition associated with composers such as Heinrich Schutz. 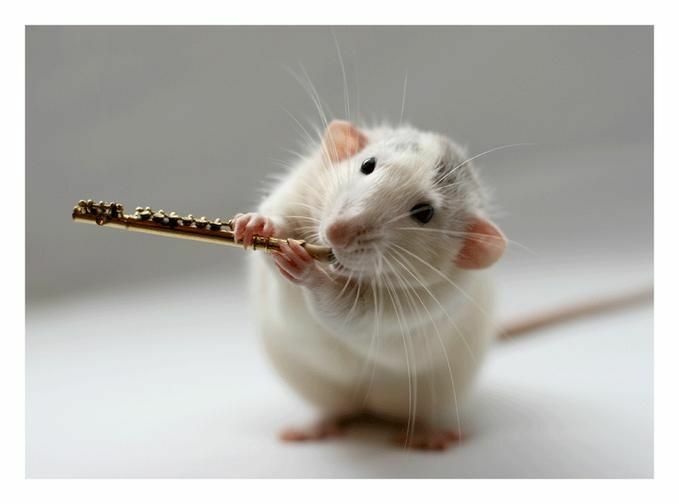 The instruments required are three trumpets, timpani, two recorders, two oboes, bassoon, organ obbligato, two violins, viola, viola da gamba and basso continuo. 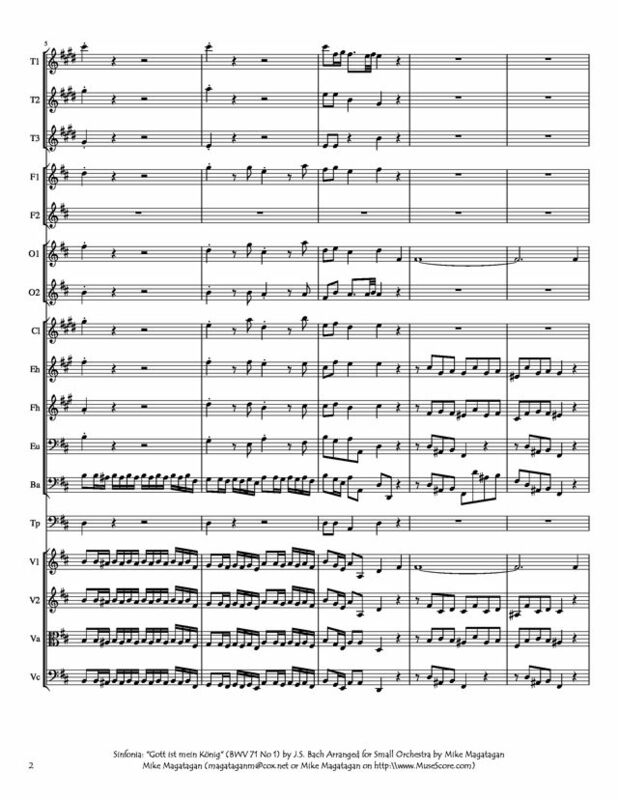 I created this arrangement of the opening Sinfonia: G"ott ist mein König" (God is my king) for Small Orchestra (3 Bb Trumpets, 2 Flutes, 2 Oboes, Bb Clarinets, English Horn, French Horn, Bassoons, Timpani & Strings (2 Violins, Viola & Cello).